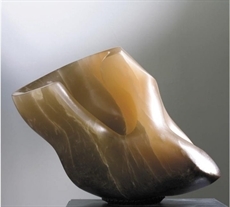 Alabaster is used by the skilled artisan masters from Volterra, and in the last ten years has also much been used in sculpture. 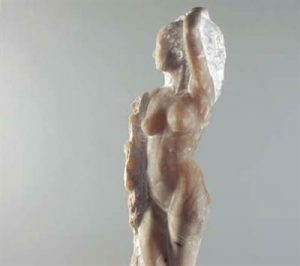 For its particular tenderness and at the same time compactness, alabaster is more easiely worked on than marble. 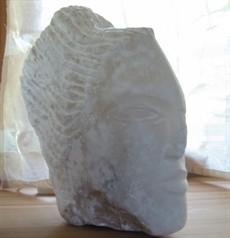 The sculptor can carve it with extreme ease, using adapt tools for sculpture. Profilo di donna con chioma di capelli raccolti. Opera realizzata con alabastro bianco trasparente. Lavabo in alabastro bianco opaco con decorazioni. Monika Osiecka, scultrice Polacca, ha studiato alla Scuola Italiana di Teheran (1978) e all'Academy of Fine Arts in Warsaw (1994) ha un master degree.